If you have employees, then you may be familiar with workers' compensation. Workers' compensation, or workers' comp, is regulated by each state. Most states will require employers to undergo annual workers' comp audits to verify that you, the employer, are paying the correct amount of premiums into your state's workers' comp fund. You will find a few tips to help you maintain records for your workers' comp records within QuickBooks below. But first, it will help if you have a better understanding of the workers' compensation system. Workers' compensation is insurance. It's designed to ensure your employees are provided with adequate wage replacement and medical benefits in the event of an injury while they're on the job. As the employer, you benefit because in exchange for having worker's comp, your employees give up their rights to sue for the tort — or wrongful act — of negligence. Therefore, employees receive assured but limited coverage, and give up some rights for recourse which is why the worker compensation system is known as "the compensation bargain." QuickBooks has a few tools to help you with your audit. You can use QuickBooks to help you organize your workers' compensation information, pull together the information quicker and reduce the premiums you pay. However, don't start with the expectation that QuickBooks will save you money on your premiums because although it happens, it is rare. QuickBooks is far more likely to help you organize yourself than save you money when it comes to worker's compensation. 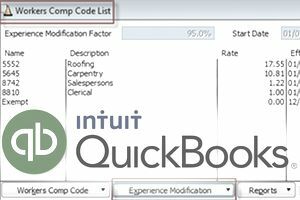 'To get started, turn on QuickBooks worker's comp feature. You can track your workers' comp by turning on the feature in QuickBooks. Select "Payroll and Employees" and click on "Company Preferences." Click on the "Workers Compensation" tab. Select the "Track Workers Comp" box. You can choose to display messaging for worker's comp in Quickbooks. After turning on the feature in QuickBooks, you will be able to enter the class codes for your small business. You can find these codes on the list provided by your insurance company. From the Menu bar in QuickBooks, select List > Workers Comp List. Then, you can fill in the information that will appear below. Next, enter your experience modification factor. You can then either assign a code to an employee in the employee record. Premiums are based on the type of work an employee performs. If you have employees who perform multiple types of work for you, you will need to enter this information in their timesheets. Assigning an employee code in the employee records will result in an error in a portion of an employees' time if he or she performs multiple job types. You can also create memorized reports. If you're audited annually, your auditor will probably request the same reports year after year. In this case, you can customize your reports and memorize them so you don't have to re-create them each year. To do this, you should create a group in the "Memorized Reports" list. Then, run a report and memorize it, and be sure to put it in the worker's comp group. You can run the group of reports at once by going to "Process Multiple Reports" and selecting the worker's comp group. Remember, this feature will only take effect from ​the date you set and won't track any workers' comp information retroactively. So if you're setting up the feature in the middle of the year, you won't capture all the information you need for an audit. Rather, you will have only captured part of the information in that year.